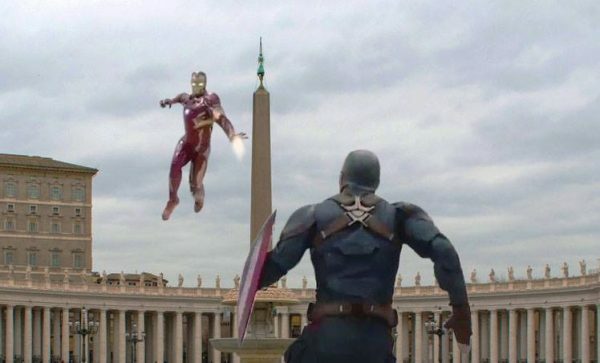 Iron man and Captain America have been seen fighting inside St. Peter’s Square this morning after witnesses say that the superheroes had had a public falling out over the recent letter from Archbishop Viganó . Reports say that Captain America had originally agreed to meet with Stark in St. Peter’s Square to calmly discuss their differences, which led to full-fledged fight between them and the other members of the Avengers team who had strong feelings on the matter. Pilgrim and vacationers alike were treated to a show of beams, missiles, arrows as Iron Man accompanied by Thor, War Machine, and Rocket Raccoon battled against Captain America who is alongside Black Widow, Ant-Man, and Hawkeye. “Stop calling it ‘Papal Bull!’” Captain America was heard yelling at one point during the altercation. Physicist Bruce Banner was asked for comment, but refused to say one word about the letter. Banner has been an outspoken advocate of Viganó . Stark and Banner attended a private meeting with Cardinal Raymond Burke a few hours after the altercation, but it is unclear what was discussed. The meeting ended when Banner discovered Burke’s pager, with a mysterious “BXVI” insignia flickering on the screen. At press time, Thanos, having been selected by the laity to judge all Catholic bishops around the world, has told reporters that the matter should be a snap.